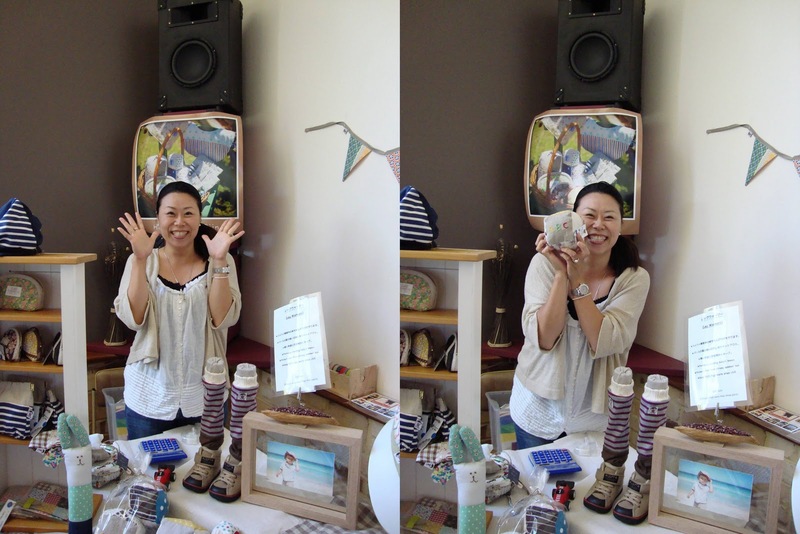 This stall is Riin's, her brand is Handmade by Riin. 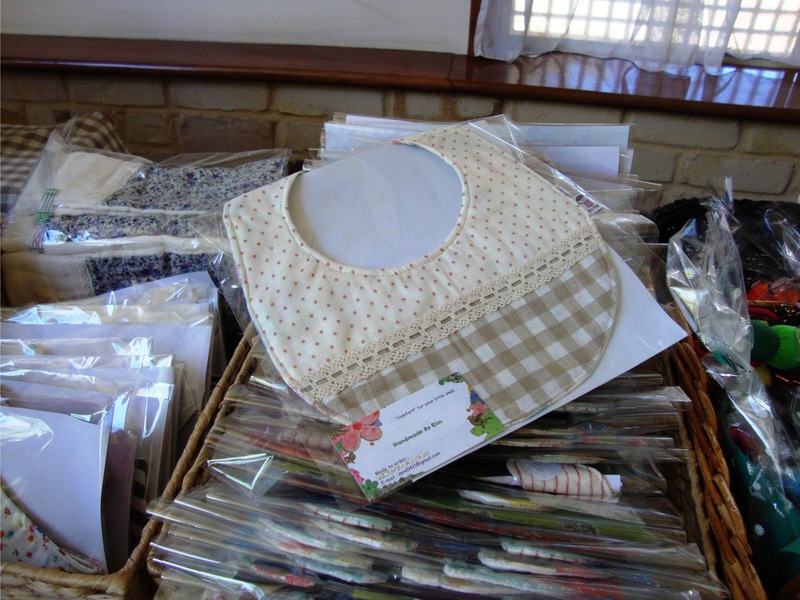 She makes lots of beautiful things as you can see in the pictures. I love the bibs... makes me wish I had a dribbly little one again just so I had a reason to buy a bib. Also there were sets of felted hungry caterpillar toys which were so cute and my Mum purchased 3 strings of bunting (which is why Riin is sticking up another set of bunting on to the wall in the first photo. I asked each stall holder if I could take photos. I took the picture on the left and then I asked if I could put a link onto my blog and quickly she said wait wait wait and picked up a stock item for her photo. So funny and such a sweetheart too! 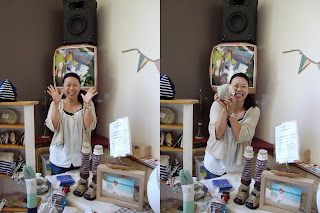 Here is Chiharu's stall. Her brand is Senhouse. This stall had the most beautiful bags and house slippers among other things. In fact her bags were so beautiful (and in demand) that I heard a lady near my table quietly willing another to not buy the bag she wanted so she could swoop across the gallery and purchase it. So funny... we've all that moment haven't we, when we can't quite make up our mind and another person suddenly takes interest in the object of our desire. The last stall I managed to take photos of was Tomomi's. Her brand is called Japanese Gifts. I love the tee shirts in Tomomi's range (especially the one in the second picture). I did miss photographing some stalls because I couldn't manage to ask the stall holder's permission to take a photo. I am sorry if yours was a stall that did not appear on this blog. Now this weekend was also a Japanese cafe experience. The food was WONDERFUL. Such a treat for the taste buds and eye too! There were also 4 demonstrations of the tea ceremony in the cafe area. I didn't get to see the whole demonstration but I did take some photos. Genki Japan donations were collected throughout the weekend and when Tomoe came past me with her smiling face I grabbed up a 50 and tossed it into her collection basket. I have managed to donate whenever there has been an opportunity this year for the Fukushima appeal. There are still many thousands of people displaced from this area, many will not have the opportunity return to their homelands for the remainder of their lifetime. Tomoe looked at my donation and asked if I really wanted to give that much, all I could say is what I always say. Without Japan there is no temari, without temari there is no happy me.